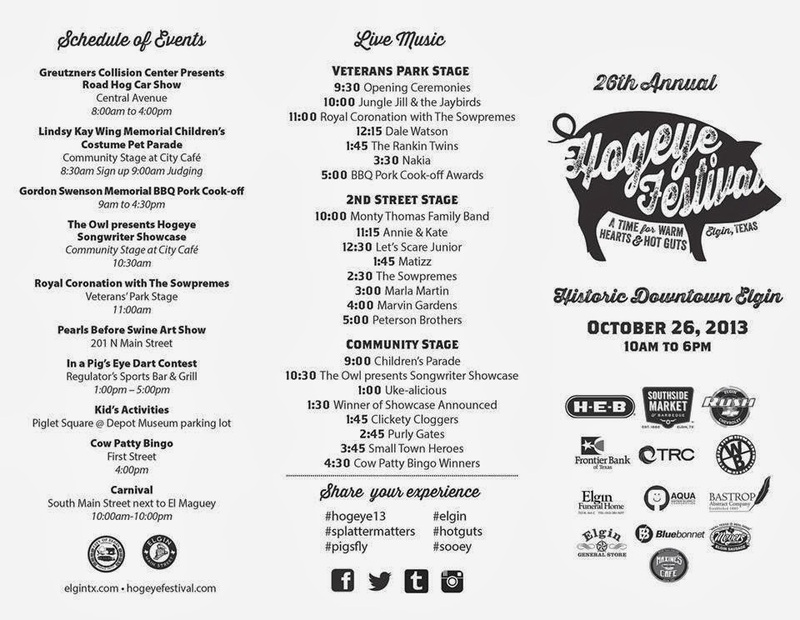 It’s a celebration of all things pig this weekend at the 26th Annual Hogeye Festival in Elgin! 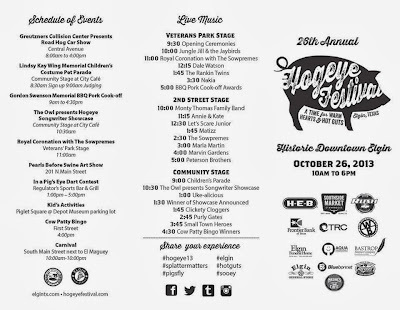 The “Sausage Capital of Texas” will be honoring that noble beast with a slew of pig-themed activities from 10:00 am to 6:00 pm on Saturday, Oct. 26th, 2013. You have to believe me when I say there will be something for everyone in the family, including the Road Hog Car Show, Children’s Costume Pet Parade, Pearls Before Swine Art Show, BBQ pork cook-off, handmade arts and crafts booths, kid’s activities, carnival, games, food, and three stages of musical entertainment. Musical guests include Dale Watson, the Monty Thomas Family Band, Marla Martin, the Peterson Brothers, and of course the famous Elgin Sowpremes! Please refer to the Hogeye FestivalSchedule and Map for more information on each of these amazing activities. Admission to the festival is FREE, and there is also free shuttle service to downtown Elgin from the Highway 95 North Park and Ride. The festival is sponsored by the Elgin Main Street Board, and all proceeds go towards downtown Elgin improvement projects…so all you pig spenders can rest assured that your money is going to a good cause. Sooey!